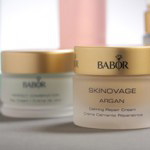 At the Oasis Spa at Baptist Health Milestone Wellness Center, all facial treatments feature the BABOR Skincare System, a premium European line made of active natural ingredients and used by estheticians worldwide. Face, neck and décolleté are cleansed, steamed and exfoliated. Impurities are extracted and skin restored with the appropriate treatment mask. Includes hand massage. Complete collagen treatment with collagen enzyme peel, mask, fluid and booster cream. Significantly reduces the appearance of lines by plumping, firming and calming the skin. For very dehydrated skin; long-lasting moisture is achieved in this signature BABOR treatment using yeast extracts from fine white wines. A deluxe anti-aging treatment to improve elasticity and moisture balance, coupled with a lengthy massage of the face, neck and décolleté. An AHA facial of 10% or 30% buffered glycolic acid. Improves hyper-pigmentation, acne disorders and the appearance of fine lines and wrinkles. Gives radiance to dull skin. Papaya enzyme mask that may be added to any facial treatment for sensitive skin needs such as rosacea, acne, sunburn, etc. A 30% free-acid exfoliator improves skin’s texture, color and tone, diminishes the appearance of fine lines and improves the appearance of acne for an overall increased glow and moisture to the skin. Tints are offered in a variety of custom-blended colors. Formulated with safe, natural ingredients for long-lasting results. Eyebrows, upper lip, chin, legs, bikini and back. Hair is removed through gentle waxing. Brows are designed and shaped to suit client’s needs. Brow tint is recommended in conjunction with eyebrow waxing for optimal shape. Personalized waxing available upon request.